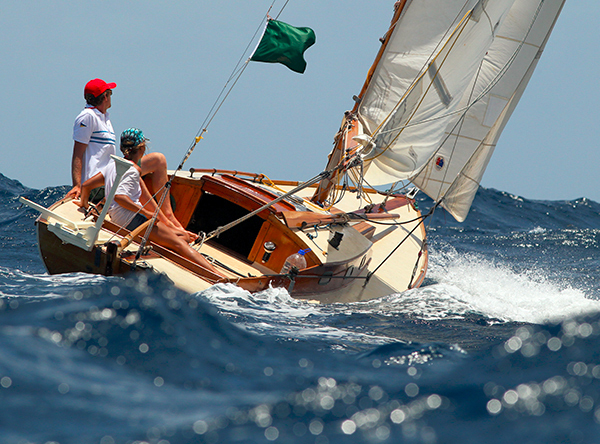 Photo by Tim Wright shows Leo Goolden sailing his Folkboat to victory at the 2015 Antigua Classic – after having sailed there across the broad Atlantic Ocean. A god example of what Folkboats are all about really. The Folkboat and all the variants of it, from sisterships to distant cousins, enjoy a unique place in the world of classic boats. You don’t have to go far to meet a fan; the further you sail on one, the more you begin to appreciate these deceptively simple-looking boats. 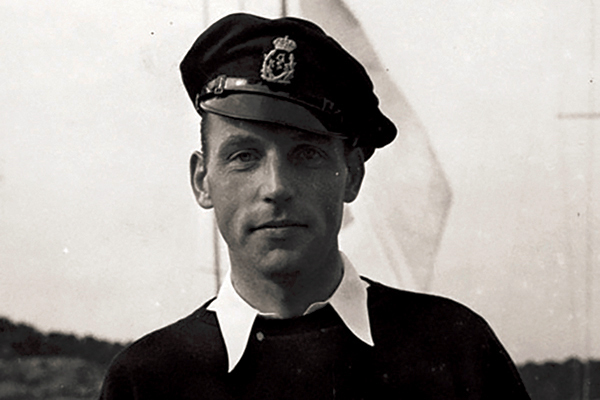 The origin of the 1941 design is somewhat controversial to this day; Tord Sunden claimed it as his but the committee that commissioned and oversaw the design process from six original designs took a different view. However it evolved, the design is a masterpiece. Designing a small yacht, especially one with pretensions to cruise as well as race, is probably one of the hardest commissions for any designer. To make it habitable, safe, reasonably fast, well-mannered and elegant (even pretty), but only 25ft (7.6m) long, is the work of genius. I learned to sail on one; a beautifully-built East German carvel-hulled International Folkboat with a raised coachroof called Nolly. She belonged to my grandparents who kept her on a swinging mooring off Derbyhaven in the Isle of Man, and they cruised her regularly to the west coast of Scotland and the south of Ireland into their 70s. On daysails as a child I can remember watching the inclinometer and my grandfather explaining the rudiments of stability to me, and about the inherent seaworthiness of the hull. With the visceral shock of the deaths in the Fastnet race of 1979 reverberating, those were reassuring thoughts; Blondie Hasler and then Mike Richey had sailed the junk-rigged Folkboat Jester across the Atlantic numerous times by then, and Ann Gash had circumnavigated hers. Nolly was fitted out pretty well by the standards of the day; stanchions and guard-rails, a self-draining cockpit, two decent berths and what (to a seven-year-old) was a palatial vee-berth forwards; it even had a WC (although it never worked) and a two-burner gas stove. Admittedly the fridge was a space alongside the steel water tank in the bilges and the engine was a byword for temperamental, but all in all it was a good match for the often challenging environs of the Irish Sea. LOA 25ft 1in (7.6m), Beam 7ft 2in, Draught 3ft 11in (1.2m), Sail area 258sqft (24sqm), Designer Tord Sunden. Folkboat lines re-drawn by Theo Rye. The hull design is approaching perfection. The sections show a flare to the topsides for their whole length; a difficult trick to marry to a nice sheer, but achieved here. The freeboard looks perilously low, especially on the Nordic version, but the boat is remarkably dry even when pushed hard. 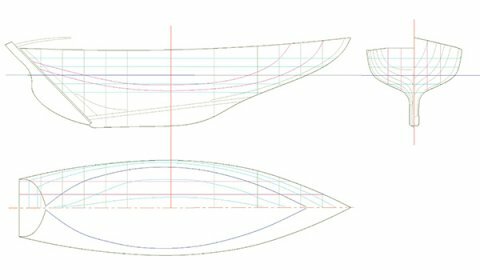 The flare in the sections means the waterline beam when upright is modest enough for decent light-airs speed, but as the hull heels it rapidly gains stability; aided by a very healthy ballast ratio (well over 50 per cent in most versions), her stiffness is perfectly judged. She is also tolerant of added weight; a good attribute in a pocket cruiser, especially one capable of crossing the Atlantic or even more, so even quite reasonably equipped boats look and sail perfectly well. The firm tuck of the bilges leading into nice, slim keel sections help generate good lift (in relative terms) from the long keel, which is a key to good sailing performance. The shape owes precious little to rating rules, only hydrodynamics; you pay for that bold forward overhang in accommodation or waterline length, maybe, but driving into any sort of sea you’ll be glad of that bargain. The slope of the transom stern tucks the rudder deep under the hull and the angle of the stern post, while typically Scandinavian, looks old-fashioned, even exaggerated; but time at the helm tells you exactly why they stuck with it. 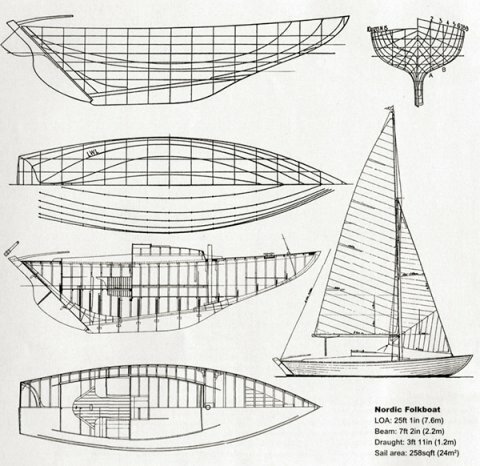 The fractional sail plan is equally well judged; with her relatively modest displacement and wetted surface area (for the type), she can slip along just fine, but will carry her canvas well as the wind comes up. She has seakindly manners that punch far above her modest weight, and her deep cockpit and nicely balanced feel on the helm all add up to a simple but satisfying boat to really sail. Whether you opt for the pretty, low and sleek, clinker-hulled Nordic variation, one of the International carvel models with more height in the cabin (at the expense perhaps of such pure good looks), in wood or GRP, or even one of the acknowledged variants like the Stella or the Contessa 26, the hull shape is so good it can cope with just about anything. Anyone brought up on modern, beamy boats who can overcome their probable prejudice against a long keel and lack of double berths (and, to be fair, standing headroom in most versions), is in for a revelation. The design of the Folkboat is an object lesson. Vorheriger Beitrag Stützspantbau zur Kojenauflage im geklinkerten Rumpf Nächster Beitrag Bau einer Pantry für "Admiral Jacob"!